The Walter Camp Football Foundation has announced the Football Bowl Subdivision National Offensive and Defensive Players of the Week, presented by Generation UCAN, for games ending November 19. Joshua Dobbs accounted for five touchdowns (3 passing, 2 rushing) and a career-best 413 offensive yards as Tennessee defeated Missouri, 63-37. Dobbs passed for 223 yards (15-of-22, 3 touchdowns) while rushing for 190 yards and two scores. 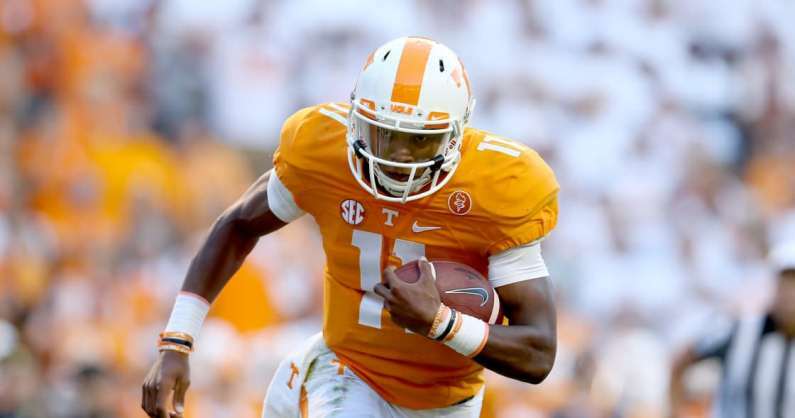 With the victory, the Volunteers improved to 8-3, 4-3 in the Southeastern Conference. Notes: Joshua Dobbs earns Walter Camp Offensive Player of the Week honors for the second time (Oct. 11, 2015). Dobbs is also the fifth Volunteer honoree since 2004. Steven Taylor recorded a game-high 14 tackles (8 solo), including 2.5 quarterback sacks, and forced one fumble as Houston defeated third-ranked Louisville, 36-10. Taylor led a Cougar defense that held Louisville to its lowest point total since the 2011 season. Notes: Steven Taylor is the second Houston defensive player to earn Walter Camp national honors this season, joining cornerback Brandon Wilson (Sept. 4). Taylor is also Houston’s seventh honoree since the award began in 2004.